This page will walk through Spring Boot Listener example. We can register servlet listeners in Spring Boot using either ServletListenerRegistrationBean or @Component or @ServletComponentScan. ServletListenerRegistrationBean class registers servlet listeners as Spring bean. @ServletComponentScan annotation scans servlet listeners annotated with @WebListener and it works only when using embedded server. In our example, we will create listeners using HttpSessionListener and ServletContextListener and provide complete example to register them in Spring Boot. ServletListenerRegistrationBean registers a servlet Listener as Spring bean. ServletListenerRegistrationBean provides setListener() method to assign the listener. Suppose we have listeners as following. We can register servlet listeners in Spring Boot by annotating it with Spring @Component as following. We can register servlet listeners using @ServletComponentScan with @Configuration or @SpringBootApplication annotations. The servlet listeners annotated with @WebListener will be scanned by @ServletComponentScan. It also scans servlets and filters annotated with @WebServlet and @WebFilter respectively. @ServletComponentScan works only when using embedded server. Find the sample listeners annotated with @WebListener. Now use @ServletComponentScan with @SpringBootApplication in Main class as following. 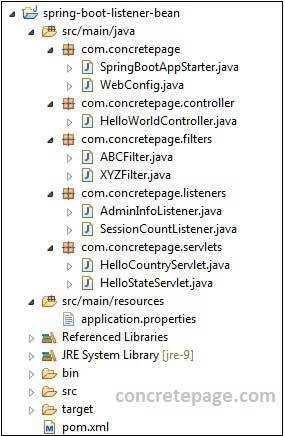 Here we will provide complete example to register listeners, filters and servlets in Spring Boot. We will use ServletListenerRegistrationBean to register listeners, FilterRegistrationBean to register filters and ServletRegistrationBean to register servlets. We will get following output in browser.